In case you haven’t noticed, Scott Walker’s presidential campaign is not exactly setting the Republican electorate on fire. In the latest RealClearPolitics national polling average of the GOP presidential race, he’s at 4% (and at 2% in the very latest poll, from ABC/WaPo). He was routinely scoring in the teens a few months ago. Worse yet, in Iowa, where he was in the lead for months after his big opening act back in January, Walker’s now tied for fourth with Carly Fiorina in the RCP average–which is bad enough, but they’re both down at 5.7% compared to Trump’s 27.2% and Carson’s 20.8%. Some blame his problems on flip-flopping, some on lack of policy chops, some on his less than scintillating personality, and some on the whole “outsider” mania gripping GOP voters at present. 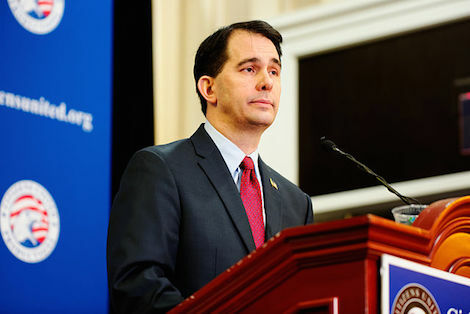 But whatever the reason, Walker’s name is beginning to drop out of those constant discussions of who will emerge from the fiery carnage of the current Trump-dominated state of the race as a “real” front-runner. And so, with a debate coming up in two days, Walker’s team has decided he should dance with the one that brung him by launching a gala national union-busting campaign! Up until now, Walker’s mostly talked about his record as a labor nemesis in Wisconsin either to show how he’d treat the overseas equivalent of “union bosses,” the Islamic State terrorists, or to make his electability claim (he busted unions in a blue state, going right at the belly of the beast, and won three times in four years anyway). Now he’s looking forward very explicitly to spread the blessings of union-free workplaces, with happy workers knowing their place under the benevolent thumb of happy job-creators, to the whole country, beginning with the federal government. Walker’s new proposal, modestly titled “My Plan to Give Power to the People, Not the Union Bosses” not only shows a heretofore unknown appreciation for Black Panther rhetoric, but a “policy” stance as hammer-headed as the good and gentle governor himself. It would abolish the right to join a union and collective bargaining for all federal employees; abolish the NLRB; abolish the principle of unions serving as an exclusive bargaining agent, and for dessert, enact a national “right to work” law that states would have to actively override if they wanted to keep union shop contracts legal. Today, the biggest problem with federal employees is that there’s not nearly enough of them. As the University of Pennsylvania political scientist and former George W. Bush White House aide John DiIulio has noted in these pages (see “The Rise and Fall of the U.S. Government,” January/February 2015), the size of the federal workforce today remains about what it was in 1960. Meanwhile, the U.S. population has more than doubled, the federal budget has quadrupled in real terms, and the number of pages in the Federal Register has grown fivefold. But hey, reality aside, taking on the Union Bosses of the Federal Government combines two hot buttons for the GOP “base” and the party’s paymasters: Washington and Unions. And it’s a sure-fire crowd-pleaser for the early state of South Carolina, whose Republican governor Nikki Haley refuses to talk to potential investors in her state if they don’t share her hatred of unions. So Walker will give it a whirl on the dance floor.